As such, we’ve assembled five budget-friendly business-minded single-cab-chassis utility vehicles to see which is the best end-of-financial-year bargain. The 2016 EOFY contenders are the Isuzu D-Max SX High-Ride, the Mazda BT-50 XT Hi-Rider, the Mitsubishi Triton GLX, the Nissan Navara DX and the Toyota HiLux Workmate. All five are cab-chassis, two-wheel-drive utility vehicles aimed more at those who need a work ute rather than a plaything for the weekend, and the aim of this test will be to see which stacks up best in terms of pricing, equipment, driving dynamics, load-friendliness and general liveability. Not all businesses are equal in their needs, though, and nor are these five utes equal in their prices. Nor, for that matter, their drivetrains: the Nissan and Toyota are both petrol (and thus more affordable), while the Isuzu, Mazda and Mitsubishi are diesel powered. And because it’s tax time, we’ve spoken to the experts to see what’s best for business buyers at this crucial time of the financial year. Anyway, the kicker is that if you find a work vehicle for $20,000, you can instantly write off the full cost of that vehicle under the plan. But if it’s $20,001, no dice – you’ll have to write off the cost in the usual way: 15 per cent in the first year, 30 per cent of the value of the asset every year thereafter. If you’re looking to trade in your old vehicle and are hoping for a used-for-new loophole, unfortunately there isn’t one. For example, if you are buying a $25,000 vehicle and you get $6000 for a trade-in – meaning you’re effectively paying $19,000 for your new vehicle – you won’t be eligible for the $20,000 tax break. The calculation is based on the cost of the vehicle, not the cash part of the transaction. Mark Chapman, director of tax communications at H&R Block, told CarAdvice that aside from the tax perks, there are other good reasons to buy at the end of the financial year. “End of financial year is a good time for small businesses to look at vehicle purchases for a couple of reasons,” he said. “First of all, car dealers often have special deals at this time of the year but more importantly, from a tax point of view, purchasing at the end of the year makes sense from a cash flow perspective, because the business can claim tax relief in its return immediately after the end of the financial year. “So, the time between incurring the expense and crystallising the tax deduction is minimised. This is particularly the case if it’s a small business taking advantage of the $20,000 instant asset write-off, in which case the entire purchase price of the vehicle is written off immediately against business profits,” Chapman said. “Anecdotally I can say that many businesses do it,” he said of sole traders, partnerships or small companies buying big value assets like vehicles at the end of financial year. “Aside from the tax issues … many businesses have a good grasp of how they’ve performed over the year by this point, and if they’ve exceeded budgets, they’ll often use some of that surplus cash to refresh their capital assets, whether that’s by acquiring a new vehicle, new items of IT (computers, laptops, phones etc.) or giving the office a refresh through acquiring some new furniture. “Obviously, retailers respond to that and offer good deals to businesses at this time of year,” he said. Chapman set out to remind potential new vehicle purchasers, “if the vehicle is used for a mixture of business and personal use, only the business element can be deducted”. “So, if I buy a $20,000 vehicle which I use 50 per cent business, 50 per cent personal use, I can only deduct $10,000,” he said. “The $20,000 instant write-off also applies to second-hand vehicles – so buying a used vehicle, which might have cost much more than $20,000 new, is a good way of getting the vehicle you want and the tax write-off you want,” he said. Thanks Mark… that’s not really what we were aiming for with this test. But hey, haggle hard and shop around, and who knows what sort of new car deal you might pull at EOFY time. With so much talk of that $20,000 mark, it’s interesting to note that only one of our vehicles on test creeps below the threshold – the Nissan Navara NP300 DX. But it only kicks off there before you consider on-road costs, and before you fit a tray to it, too: all five utes here have optional trays fitted, as cab-chassis models can’t be sold without a tray. Let’s take a closer look at how each of these utes stacks up in the value stakes then. For businesses, the bottom line counts, and we’ve gone for the most basic versions of each of these utes available to see how they rank. Note: as the winner of our dual-cab test we would have loved to have had a low-spec Ford Ranger as part of this test, but there wasn’t one available. We’ll start with the most affordable vehicle here, the Nissan Navara DX, which has a list price of only $19,490 plus on-roads and tray costs. That makes it more affordable than cab-chassis offerings from some less desirable brands out of China and India. It only comes with a petrol engine and manual gearbox, though. Next up the pricing tree is the Toyota HiLux Workmate, another big name player with a sharp entry price of just $20,990 plus on-road and tray costs for the petrol manual, and $22,990 plus costs for the petrol auto version tested here. A branch higher is the Mitsubishi Triton GLX. You can get the Triton at a budget-friendly $21,990 plus on-road costs for the base model petrol manual, but we couldn’t secure one for this test. Instead, we’ve got the diesel auto GLX variant, which kicks off from a still-affordable $27,990 plus costs (you can get one with a manual ‘box for a $2000 discount). The Mazda BT-50 XT base model ute starts from just $25,570 plus on-road and tray costs, but that’s the lower-riding diesel manual model. We got the higher-riding diesel auto model, which kicks off at $28,815 plus the extra costs. 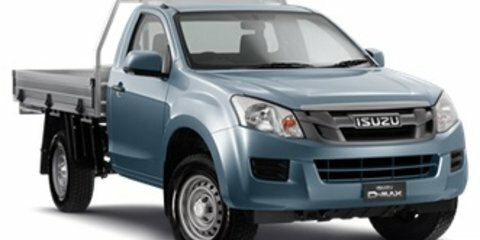 The most affordable Isuzu D-Max ute ain’t cheap, coming in at $27,400 plus on-road and tray costs for the low-riding diesel manual, while the high-riding diesel auto model we have here just slips outside our desired top dollar mark, at $30,500 plus the other costs. It is worth noting that only the Mazda and Nissan have mesh protection over their rear windscreens, while the Nissan is the only one with dual side steps, and the Mazda is the only one with a rear ladder rack (and no, they don’t come pre-bent: that occurred before we had the vehicle). All five utes tested have similar simple levers for lowering the tray sides, and all five also include a handy tie-down runner on the inside of the tray to secure your load, but just be aware that larger tie-down hooks may not fit through the pre-drilled holes. All five have outer tie-down rails, too, though the Toyota misses out on them over the wheel-arch (right in the middle of the tray), which can be annoying. All makers also offer more sturdy steel trays, too, but these are the sorts of trays you can expect to find fitted to the models that will be offered in any driveaway deals and you can expect to find sharp deals before June 30. A cursory glance at each of the respective manufacturer’s sites indicates as much, too: the Isuzu as tested is going for $28,990 driveaway; the Mazda is going for $30,500 driveaway; the Mitsubishi is $30,490 driveaway; the Navara hasn’t seen a big push in single-cab yet, so is estimated at $24,990 driveaway; while the HiLux can be had at $23,990 driveaway for the manual, so expect to pay about $26K for the auto, on the road. Price is only one part of the equation though: equipment is the other. And let’s get one thing straight: these aren’t packed with the goodies you’ll find in similarly-priced passenger cars. Still, in the HiLux you get a touchscreen media unit, and it’s the only ute here to boast that technology – whether tradies love that or not after a few potential paint – or worse, plumbing – smears remains to be seen. All five have USB connectivity, Bluetooth phone/audio streaming technology and steering wheel audio controls, while the Isuzu, Mazda and Nissan get four-speaker stereo systems. The Mitsubishi and Toyota have two speakers each. All five have electric windows and mirrors, cloth seat trim and vinyl flooring. Cruise control is standard on all models, too, though the Triton is the only one with tilt and reach steering adjustment, and it also has voice control (the Toyota also has a button for this, but it doesn’t actually work on this spec!). It may seem weird that the Isuzu is the only one with colour-coded side mirror caps, but the strangest specification quirk we’ve see in recent times, though, is the Navara DX, which goes without remote keyless entry. Yep, you have to lock and unlock the doors manually. But it does have halogen daytime running lights and, strangely, auto headlights (as does the HiLux). None except the Mazda have any form of parking assistance, though the BT-50’s optional ($820 fitted) rear-view camera display shows up in the rear-view mirror (which, as a bonus, features auto-dimming! ), but it can appear washed out in sunlight. Still, we’d take having one over not having one any day of the week, as parking these things can be a task if you’ve got a load in the back. Further, Toyota offers the option of a camera fitted as an accessory for the media system ($430 fitted),while Mitsubishi doesn’t offer one and nor does Isuzu. As for other safety items, every vehicle on test has stability control and traction control – which is helpful, given they can spin the rear wheels quite easily without a load, particularly in the wet. As for airbag coverage, the Mazda has dual front and curtain bags (four total), while the rest have side airbags as well (total: six), and the Mitsubishi, Nissan and Toyota add driver’s knee airbag protection (seven). As we mentioned, the HiLux is the only vehicle here with a modern touchscreen media system, and as a result the interior of the ute feels more car-like than most of the other vehicles in this test. That screen clearly adds some flair to the cabin, though the cabin of the HiLux is smaller than all of its rivals, with less room for taller occupants and less space behind the seats. It’s also the only vehicle here with single-piece seat backrests, and as such it lacks headrest adjustment. The HiLux (and D-Max) both have dual gloveboxes, which is handy for storing loose items, though it does have a smaller central storage bin between the seats. The ‘Lux has dual cup-holders as well as bottle holders and slim-line pockets in the door skins. The next most car-like (or, more correctly, SUV-like) interior is that of the Navara. It offers better storage than the HiLux, and while the design of the dashboard may have some less-than-cohesive elements, it is a smart looking space. It’s on top of the game for storage, with pop-out cup holders in the dash, as well as large cup holders between the seats and decent door pockets with bottle storage, too. There’s a little bit more space behind the seats in the Navara, as well, and it has three 12-volt outlets in the cabin (the Triton, HiLux and D-Max have one, while the BT-50 has two). Similar in space is the Triton, which has big door pockets, decent cup holders but a pretty small centre console area. The D-Max, as the oldest vehicle here, still feels fine inside, if a little dour. Admittedly the media interface is quite early 2000s, and that does pull the ambience down a bit, but in terms of convenience it’s quite impressive: the aforementioned dual gloveboxes, pop-out cup holders and additional holsters between the seats make it amenable for business use, though the door pockets are a little small. It’s basic, but it does the job for someone who just needs a vehicle to do a job. The Mazda is a bit more fiddly in its dashboard layout, with the hangover button pad phone controls looking a little out of date in 2016, not to mention the little screen that sits atop the dashboard (but it’s still second-best in this rabble of lacklustre infotainment options). All on test agreed the Mazda had the most comfortable seats, and it has convenience well sorted, too, with good-sized door pockets, cup holders between the seats, and useable space behind the buckets. Work utes like these are probably most likely to have a few hundred kilograms in the tray at all times. That was certainly the case at the building sites we shot near, where single-cab utes were plentiful, and their cargo areas were mainly adorned with toolboxes full of equipment, as well as a few sundry items scattered about the tray. We chucked some gear weighing around a couple of hundred kilos in each of our utes to test the differences between the behaviours of the five, but it’s fair to say that our estimated 350 kilograms of load is nowhere near what any of these utes is capable of containing. According to the spec sheets – and, bearing in mind that these figures depend on the tray/bodywork fitted to the ute – the BT-50 tested has a huge 1508-kilogram payload, the highest on test. The next best in terms of payload ratings is the Isuzu D-Max, with a 1265kg capacity, followed by the Navara with 1228kg, the HiLux with 1210kg, and the Triton with a somewhat meagre 1165kg rating. 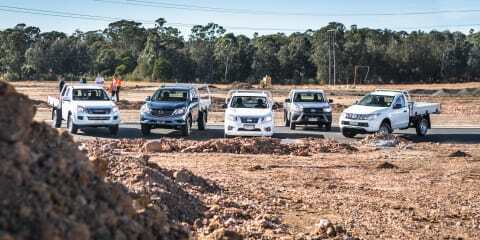 That comes down to the Triton’s relatively low gross vehicle mass of 2720kg; it isn’t the lowest GVM here – the HiLux is 2700kg, Navara is 2550kg,while the D-Max is 2850kg and the Mazda is a huge 3200kg. Mainly it comes down to the fact the Triton is on the heavy side at 1555kg (still not as heavy as D-Max at 1580kg nor the portly BT-50 at 1692kg). The HiLux tips the scales at 1490kg with the auto ‘box, while the Navara is a lightweight at just 1322kg. When it comes to towing capacity, the Mazda also hits harder than its competitors in this test, with a braked rating of 3500kg, while using a trailer without brakes it, like all other vehicles on this test, is limited to 750kg. The next best for towing are the Isuzu, Mitsubishi and Toyota, all with 2500kg braked capacity. The outlier here is the Nissan, which has an extremely limiting braked towing capacity of just 1588kg. That could be enough to wipe it off the list of some potential purchasers – but that’s the price you pay for a lighter vehicle. It’s worth noting that the HiLux’s lower stance made for easier loading in and out, whether you’re doing it manually or with a forklift – and if that’s important to you, there are lower-riding versions of the D-Max and BT-50, too. As mentioned, we tested all vehicles with and without a load – read on to find out how they fared. First, let’s look at how each performed when free of load duties. At the top of the pile is the Nissan Navara, which offers a suspension tune that is better than some SUVs, managing a measured level of bump composure and body control that is commendably mature. It isn’t infallible, though: the steering of the Navara is it’s biggest disappointment. It is adequate at higher speeds on the highway, but encounter a corner and you’ll find that it requires too much effort to make its way around it. That’s exacerbated by one of the slowest steering racks around, and in town that means parking can take a lot of arm-twirling (but none of these vehicles are exceptional at low-speed ease of use like the benchmark Ford Ranger). Still, we’d forgive the Navara in that regard for the level of comfort it offers. Next best for driving load-free is the Isuzu D-Max, which has a softer suspension tune than the rest of the brigade that allows it to keep those in the cabin relatively remote to what’s happening when the surface underneath changes. The suspension can lack a little composure over offset bumps, and the steering is wallowy when empty, and worse when loaded. The BT-50 is the next best for comfort, though it is slightly sharper in its reactions over sharp bumps than the D-Max. The BT-50’s other talking point is its heavy, but quite reactive, steering, which makes it more involving to drive, but a bit of an exercise – literally – to park. That said, it feels solid and hefty and manly and workmanlike. The Triton’s steering is middle of the road, proving to be accurate enough and responsive enough to mean it isn’t worth complaining about. Its ride, though, warrants a whinge, proving even sharper than the already-mentioned competitors. It picks up a lot of the smaller inconsistencies on the road, and the rear suspension jolts uncomfortably over sharp bumps. While the Toyota’s steering is not as slow as some we couldn’t recommend anyone buy the HiLux if they don’t intend to drive around with at least a few hundred kilos in the tray at all times. The suspension means it feels way too stiff, and the suspension seemingly doesn’t work to soak up any of the impact the rear springs compress. It is unnecessarily jarring, while other adjective utterances from the testing crew included “fierce”, “appalling”, “unnecessary ”, diabolical” and, from a few females in the office, it was said to be so uncomfortable that sports bras would be required at all times. Berlei tie-up with Toyota, perhaps? It’d sell utes to tradies, undoubtedly. Jokes aside, though, the ride without a load on board is, quite simply, shithouse. When its tray is full, though, the HiLux is actually quite good. In fact, it dealt with a big load better than the Navara, with the stiffer suspension clearly coping a little more comfortably with the mass over the rear axle, offering decent levels of composure over bumps and a bit less lean in corners, and it was still easy to steer. The Navara is fine with a smaller load in the tray but a bit wobblier with a really heavy load on board. The D-Max was unflappable with a load in the tray. It simply feels solid and sturdy, albeit a little let down by – again – slow steering that means you seem to be constantly chasing the nose of the vehicle around corners. It’s even worse at very low speeds, requiring heaps of effort to position. The most assured of the diesel models with a load on board was the BT-50. Its ride is better with a load, but still a little hard over some bumps, and with mass on board it, along with the Triton, seemed to suffer a bit of side-to-side movement over bumps that took a while to settle. The Triton was even slower to settle after bumps with a load on at low speeds, swaying from side to side as the suspension caught up with what had occurred seconds ago. Its steering, though, was appropriately responsive under load. Any of the pluses for each of these five vehicles mentioned above could be considered irrelevant if the engine under the bonnet of said models doesn’t stack up. Let’s run through the details, starting with the petrol engines. The Navara has a 2.5-litre four-cylinder petrol engine producing 122kW of power (at 6000rpm) and 238Nm of torque (at 4000rpm), which is hardly a huge amount of grunt for a workhorse ute. It, like every ute on test here, is rear-wheel drive, and it channels its grunt through a six-speed manual gearbox. There’s no automatic available in this specification. Compare those figures with the Toyota – which has a bigger 2.7-litre petrol four-cylinder producing 122kW of power at 5200rpm and 245Nm of torque at 4000rpm – and it’s clear there’s little to separate the two. Except the fact the Toyota can be had with an automatic gearbox, as our vehicle was. The six-speed unit, as mentioned in the pricing section, is optional. You’ll either consider a manual gearbox, or you won’t – we get that. And there’s a fair argument based on our testing that the Toyota’s auto does a decent job of making the most of the petrol mill’s outputs, as it felt a little less stressed when loaded up than the Navara. Indeed, the Navara feels like it needs more revs to get the most out of it, and while in practice that’s not an issue, some testers noted it was a bit counterintuitive to want to rev the ring out of a ute, particularly after experiencing the relative effortlessness of the diesel trio’s low-range torque. But that’s simply the characteristics of each of the engine types. If you can deal with working the Navara’s engine hard, you may find rambling through the gears quite rewarding, thought it may require a bit of work to get up steep hills with a load on. The HiLux isn’t without its gearbox quibbles, though. It can be busy swapping between cogs of its own accord at highway speeds, searching for an adequate torque zone to keep at pace with the traffic. It, as with the Nissan, finds hills a bit challenging, too. As for fuel use, the claims for the respective engines are realistic: the Toyota claims 10.9 litres per 100km, while the Nissan claims 9.9L/100km. We saw 10.9L/100km for the Navara and 13.6L/100km for the HiLux. Ouch. Those figures, interestingly, aren’t that much higher than what we saw from the diesel trio. The D-Max, which claims consumption of 7.9L/100km, recorded closer to 10L/100km; the BT-50 claims 7.6L/100km, but we saw an average use of 11.7L/100km; and the Triton has the most impressive claimed consumption, 7.3L/100km, where we saw 9.2L/100km. The biggest engine on test belongs to the D-Max, with its tried-and-tested 3.0-litre four-cylinder turbo diesel unit. It has been around a while, and while its bigger capacity makes for more relaxed motoring, it is falling behind in terms of pulling power. It has 130kW of power at 3600rpm, while torque is pretty low at 380Nm between 1800-2800rpm. The D-Max’s engine feels effortless, or perhaps even lazy. It never feels flustered, no matter the load on board, and while it is noisy, it’s still quite refined in the way it builds pace. While it may be down on grunt compared to its newer competitors, the D-Max’s engine feels more than capable in most circumstances. The five-speed automatic makes good use of the engine’s torque, and shifts smoothly in most instances, albeit with a little bit of slurring between gears at times under light throttle. Still, it really is a fuss-free drivetrain. The Triton’s 2.4-litre four-cylinder turbo diesel engine produces 133kW of power at 3300rpm and 430Nm of torque at 2500rpm. It has a five-speed automatic gearbox. The Triton’s engine is a standout in terms of diesel engine quietness in the commercial vehicle segment. We’ve commented in the past about this generation Triton that it makes some of its rivals seem noisy, and that was the case on this test, too, and it’s particularly impressive under harder throttle or heavier load. There’s a slight amount of lag from a standstill if you jump on the throttle aggressively, but the torque is plentiful when you’re gentle on the throttle, and the automatic transmission does a good job of choosing which gear is required based on load and the driving circumstances. Under hard throttle the transmission can wallop into the next gear, which is kind of reassuring in some circumstances, and a little disconcerting in others. The BT-50’s 2.2-litre four-cylinder turbo diesel pumps out 110kW of power at 3700rpm, while torque is rated at 375Nm between 1500-2500rpm. It has a six-speed automatic transmission. The Mazda’s engine is noisier than its two diesel rivals, particularly under mid to hard throttle, and we noted just a touch more lag, too. Still, this isn’t a dud engine, with adequate torque to get the job done, no matter how big or small that job is. The gearbox is a little slower in shifting, meaning the engine will rev out a little longer, but when the shifts happen they are smoother than the other two diesels here. If warranty cover is your main concern, the Isuzu and Mitsubishi may cater more to your desires than the other three vehicles. Both the D-Max and Triton come with a five-year/130,000km warranty, where the HiLux and Navara have three-year/100,000km warranties, and the Mazda, oddly, has a two-year/unlimited-kilometre warranty, but if you haven’t hit 100,000km at the end of that two-year period, the brand extends cover to three years or 100,000km, whichever occurs first. Isuzu offers a three-year capped-price service program, but maintenance is due annoyingly regularly – every six months or 10,000km, whichever occurs first. Over the plan’s 60,000km duration, that works out to an average of $387.50 per visit, but bear in mind if you travel a lot of kilometres, your ute will be in the shop more regularly. The brand also offers five years’ roadside assistance. Mitsubishi has a capped-price plan that requires maintenance in a more lenient fashion – every 12 months or 15,000km – and over a 60,000km period the average visit will cost you $522.50. Nissan’s three-year warranty is complemented by three years of roadside assistance, and the brand offers a six-year/120,000km service plan. Maintenance is due every 12 months or 10,000km for the petrol model, with an average cost over 60,000km working out at about $328 per visit – but again, if you’re a mileage monster, this could work out to be pricey over time. Mazda requires the BT-50 be serviced every 10,000km or 12 months, whichever occurs first, which is more regular than most competitors. Its plan runs to 160,000km, and over the first 60,000km of ownership the cost per visit averages $443 (again, big km-coverers may wish to think about how much it may cost). The HiLux is another that needs servicing more regularly than you may expect, with maintenance required every six months or 10,000km, whichever occurs first. At least Toyota doesn’t charge as exorbitantly, with the average cost just$180 per visit, so it’s not even that pricey if you have to go twice in a year. These five utes may appeal to different buyers for different reasons, but we set out with the mindset of offering potential business purchasers the best option if they’re after a petrol model, and the best option if the budget can stretch to a diesel. As you may have gathered, we didn’t particularly like our time in the Toyota HiLux Workmate, given that the vast majority of that period was spent with it un-laden. With a tonne of material in the tray it is more amenable, but unless you’re going to be loaded up like that at all times, we would suggest you shop around, because if it were your actual workmate, you’d probably look for another job. As such, the Nissan Navara DX is our petrol cab-chassis ute pick in this test. Admittedly it doesn’t have the towing capacity or the wilful urge to do the same level of serious work as its diesel rivals, but as a light-duty commercial vehicle it is entirely capable and offers unbeatable value for money, and unbeatable comfort, in this entry-level ute class. When it comes to the diesels, there was a clear victor, too – the Mazda BT-50 XT. This sturdy, strong and superbly capable vehicle offers better towing and payload capacity than its competitors. It’s the sort of ute that feels better than its competitors in many ways. It is hard to split the other two diesels on this test. The Isuzu D-Max SX offers a slightly better level of comfort around town with nothing in the tray, and it has a bigger tray with a higher payload. Those things may be hard to ignore, but the level of noise in the cabin from its truckish (but strong!) diesel engine is hard to ignore, too. The Mitsubishi Triton GLX is much quieter and more refined, and while it is harder riding when empty and a bit wobblier with a load on board, it is the sort of ute that simply doesn’t feel like a chore to drive thanks to its slightly quicker steering and more modern cabin compared with the Isuzu. Naming an overall winner is a matter of each to his or her own. But for what it’s worth, two out of our three testers said they’d be happier with the Navara than any of the others, and the third judge said the BT-50 was the one for them.